I am getting the hang of organizing information within Tinderbox, but I am stuck with getting information out. Could someone point me in the right direction for getting information out? I tried the templates from 2002 found here: http://www.eastgate.com/Tinderbox/GetTemplates.html, but I couldn't get them to work. At a minimum, I would like to export a separate html for each day (level 2) so that students can follow along with the agenda. Ideally, all of the days would be linked together. The "index" page would have links to each class day. There would also be a page for things like "homework" where all of the assignments are grouped together with point values, PDFs, links, etc. I'm familiar with html and css, but I don't know how to set this up in Tinderbox. Any help (links to similar projects, code snippets, directions) would be much appreciated. This is one case where, in my experience, early structure works. Prototypes help too. Why? Because you can set nested structure so OnAdd sets the correct prototype type. As you can set the export template in the prototype for all notes needing the same this makes it easy to test/tune and export using several prototypes. From your scenario, you want to set Week containers to not export but to export their children (see notes' HTML view). This is a good point to note that each not can only export to its outline location. Export a note 2 levels deep? Its exported 2 folders deep in the export location. Now each week exports a folder but not page for the week note. The container will hold a page per activity/homework. These can easily link to the next/previous note. I suggest downloading aTbRef's source TBX and looking at the export templates ('5-basic_all' is a good start) for instance you might want to test for a next note that isn't of prototype "Homework", i.e. so only activity notes are linked. If testing next/previous links, don't use map adornments. Why? An unindented design side effect in v5 is these are detected as siblings and but can't be tested. IOW TB sees a sibling but doesn't easily let you strike out adornments - or so I've found in doing some complex export scenarios. TL;DR version - don't mix adornments with this sort of export. Now the index. Make an agent to find all classes (days) and sort then in original outline order. Export this as the index page. A homework list? Another agent. Hopefully you can see that prototypes will make the agent queries much easier. Setting a common HTML template for whole groups of notes. Easily finding groups on notes in queries. Thanks for pointing me in the right direction. I downloaded the TBX file and it would be great to try to adapt it for my use. I'm having a difficult time following along, but I will try to break it down and figure it out. I'm sure I'll have further questions. The latter two actions ensure the code doesn't fire in the prototype itself - very useful if like here the $Rule renames the note. The week template renames itself based on sibling order. Re-order the weeks? just drag re-order the week containers and they will update. Items added to week notes automatically are set as 'Class' notes. Be aware that Homework type notes need to be manually re-assigned the correct prototype but this shows how automation hits some limits. Class notes use the same method as Week notes to set a class number. If there is a module code this is shown after the note name. A rule rather than a display expression is used to ensure these position based updates work correctly if an item is moed in order. Homework items children are assigned the "Homework item" prototypes. Dates haven't been added in here but could easily be accommodated such that from a term start data all lessons could date them selves accordingly. Skips for holidays, etc., add complexity but can be handled within reason; if too hard your programme is less programmed than perhaps you assume! The class and homework listings can now leverage this. Each export is an agent - see their queries for how they pull data. Don't overlook the non-default $Sort in the agent which ensures the items list in original outline (thus data order). 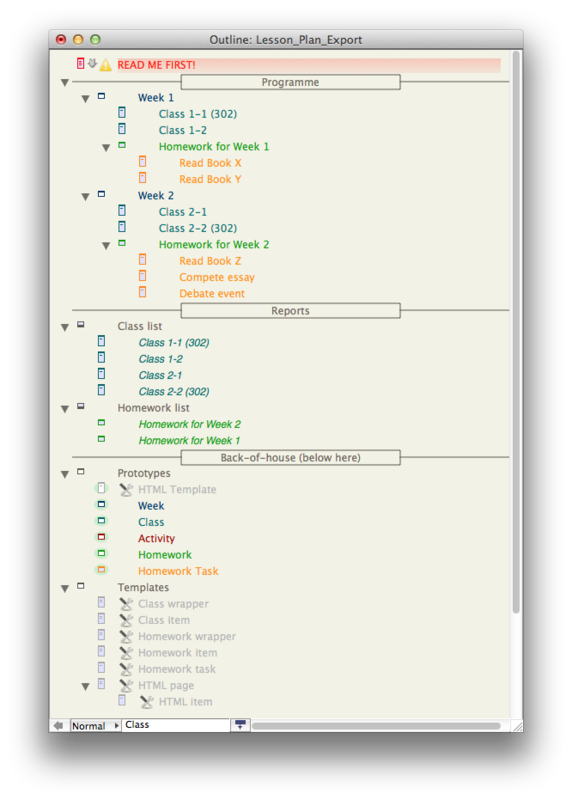 Each report uses a slightly different set of templates using a different template cascade. Once set up and with correct prototypes, the list assembles itself. This is just a small flavour of what can be done! After writing this file it also occurred to me that depending on the structure of your system, you might also be able to add week notes that add specimen class notes etc - see prototypes & bequeathing children. It's also worth looking at past threads - search with the keyword 'syllabus'. Thank you so much for your generous help! It is definitely the direction that I want to go. Thanks to you I have a solid start. I don't understand what is happening with the code, but I now have something to study. I'm working through the linked file and I have a quick question— don't see "programme" in map view. Am I missing something? I can see it in all of the other views. Maps don't draw separators (as other views don't draw adornments)**. The file wasn't written with map view in mind. But, it's easily fixed - just select 'Programme', open the Rename dialog and un-sick the 'Separator' box. You can put a non-nesting separator above Programme is you so desire. Indeed, if you're in the US you might want to call the latter 'Program'. If you do that, you will need to also edit both the agent queries. The point of putting all the programme/syllabus in one tree off the root is for easier querying. It might be you've classes your'e working on that aren't yet ready. Work on them outside the Programme hierarchy and then drop then in the (exerting) part of the document when ready. Something I forgot to do, was to set the other parts of the document (e.g. back of house stuff) as non-exporting. Essentially rather than select each report and use HTML view to export just that HTML file, you want to set the document up so a whole-doc export only produces the couple of files needed. When designing export, I'd advise using Outline view, even if for general use you revert to map. Why? TB export works off the outline-based relationship of notes so it makes sense to have that displayed as you work. It is also why the two reporting agents are placed at outline root level, so they export at that level. Had, for instance, I nested them in 'Programme' they would then have exported into a folder called 'Programme' within the designated export folder. Don't struggle with the code - by all means ask - and don't forget aTbRef offers an extended reference to action and export code. For detailed discussion of particular codes/techniques please consider starting a new thread so this one can stay on the overall task. ** By original design intent separators didn't allow nesting, but by the time it was discovered that they did allow nesting some people were already using that feature and asked to keep it. Thus the inexact correlation with adornments! Unchecking Programme was an easy fix! I'm currently trying to figure out how to mark something as non-exporting. It makes sense to only export what I want to be available to students. I'll post back if I figure it out. The export of children is controlled by the second from top-left box. If using prototypes, and if export control attributes are likely to want to inherit, don't forget to pen the HTML view for the prototype and not the current content note. If you mess up inheritance, you can reset inheritance. I think I'm getting close to having a working system. 1) Would I put "$HTMLDontExport" as a rule for notes that I don't want to export? I'm thinking about making personal notes that I don't want to publish. I understand that I can keep it out of "programme," but I would like to have these in context. I'm thinking that I should make a prototype for notes that I don't want to export. 2) Based on what you have done, it looks like I could have agents generating different reports. - go to the item I want to export in the outline, open up a new html view, pull down class wrapper and then export. - go to the next item I wan to export, open up a new html view, etc. . Ideally I would push a few buttons and everything would update. 4. Now that I am beginning to understand this, my next step is to figure out a way to have some sort of index.html which would have a links to the different pages. I'm really beginning to get how deep and complex this program is. . .thanks for guiding me through it! 1. Basically for any non-printing sections (e.g. the whole prototypes tree) select the root note (i.e. "Prototypes"), open it's HTML view, untick the two left boxes. Done! You need never touch those again. For notes amongst content that you don't want to export for any reason, you can either set them to not export via HTML view or via a stamp (code: $HTMLDontExport=true), or use an alternative prototype set at prototype level to not export. the latter means you can then toggle back to an exporting prototype if you want to export. Bottom line: where possible let prototypes do the heavy lift. The more things you tweak at note level re export/not export the more likely to are to get an unwanted result (we forget things!). 2. Absolutely! This is just how TB can really help. For teacher vs student reports ideally use the same agent but with similar but different templates: same cascade but teacher set likely pulling in extra pages/attribute value data. 3. Set up the exports as per #1 above and then just export everything. 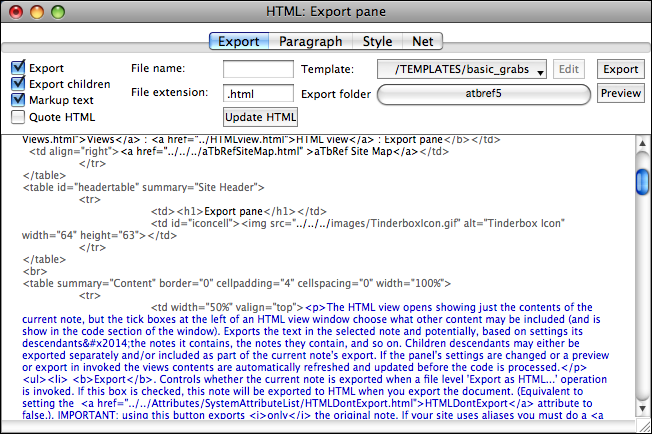 To only export a single report, open its HTML view and hit 'Export'. Note that full export doesn't overwrite existing HTML pages unless $Text has changed. If in doubt, just trash the old export before doing a full export. The export from the HTML view always overwrites any existing file. Full export is very fast so if you've got the 'no export' parts correctly fenced off most of the time you can just export everything even if you're only using one page. Bottom line: depending on what you're doing the choice of full or page only will vary. 4. Assuming you're only exporting reports, then thse will ba series of root-level agents. You can add a root level note, open its HTML view and set the export filename to 'index'. Set the note to use template "HTML page". In the note's $Text add text that will be the on-screen clickable label text for each report. Make that each label text a TB link to the report in question (i.e its TB note) and on export TB will make the inter-page links for you. If you want lists of student suff vs teacher stuff, just set up the note's $Text accordingly, e.g. two separate bulleted lists etc. Or have 2 index pages - on for each group. Or an index page pointing to per group index pages. Anyway, I hope you get the picture. I've just update the earlier Zip with a TBX with an index page example. I definitely get the picture now! Wow! What a powerful program. The zip file was enormously helpful. Thanks, again. I'll keep this question in this thread in case someone else uses the zip file Mark produced. I have adapted this code from the Class Prototype. I don't know how to add the end date into the equation. In addition,I don't want the time to be in the title. Thanks for any help or links. The 'l' date format (lowercase L) is the short local date. This is locale dependent. It is 31/07/2013 in UK, in the US it will be 07/31/2013 (possibly 07/31/13), etc. The locale used is that of your Mac OS account and isn't controlled by Tinderbox. If you're wanting Chilean date formats on a Mac with a Swedish OS locale then you may need to use the full date format syntax and construct the desired date from its constituent parts. … +"["+$StartDate.format("MM d")+" - "+$EndDate.format("MM d")+"]"
See date() for more (I just updated the aTbRef page to give more examples). In addition, I don't want the time to be in the title. Just use Date.format() to format the date as desired, in the manner discussed above. Don't worry at this point, but i should make the point that complex rules don't always scale well from 'how-do-I?" tests to a large real document because everything is constantly re-setting itself. In other words, what's crisp in a small test may be less so in a big document. In such a case, consider moving all/most of the $Rule code to agent(s) as the latter can be turned off when not needed thus stopping repeating action code execution. It transpires, in v5.x anyway, that expression evaluation in rules/agents in much more efficient than in a Display Expression (same may be true for Hover & Table Expressions). If in doubt, experiment - at worst you need one extra String-type attribute. When starting out, don't get too hung up on performance, but do be aware that you may need to adjust as your TBX. Still, as TB allows easy incremental enhancement this isn't the issue it might be in a formal database, for instance.